The fern covered Founder's Grove. 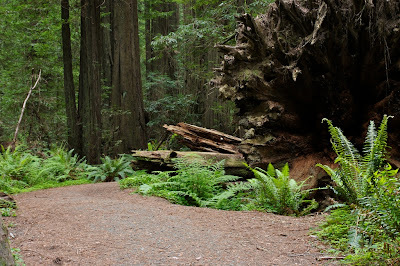 By far the most popular attraction along the Avenue of the Giants is the 1.6 mile Founders Grove loop. We arrived at the crowded parking lot to overhear one woman remark to her friend "It's kind of like Avatar cause it's so green, only not as green!" The majesty of these trees might be wasted on such people, but it was not wasted on me. Fallen Redwoods just off the trail. 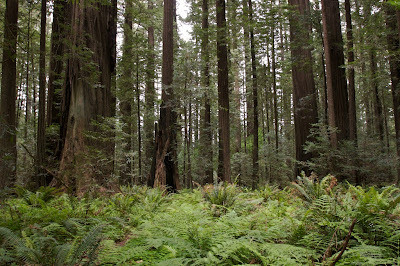 A stroll through the Redwood forest at Founder's Grove is a unique experience. The trees here are tall even among giants. 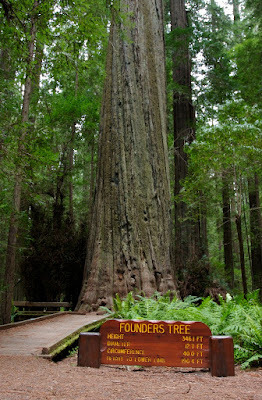 The well marked founders tree is 362 feet tall. That's longer than a football field from endzone to endzone (120 yards). The founders tree, while interesting, does not compare to the rest of the walk through the woods. The trail meanders through the primeval forest covered in ferns and dominated by the giant trees. From time to time a fallen giant can be found lining the trail with their massive root balls lifted into the air. Periodically the stillness of the forest would be broken by the shudder of a powerful breeze, our first warning signs of a storm to come. 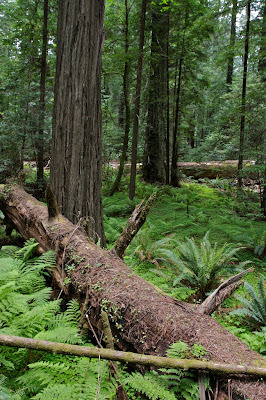 Among the fallen is the Dyerville Giant, a 262ft redwood that fell in 1991. Because the grove is one of the most popular attractions along the avenue of the giants the constant chatter of families and the hum of cars is a disturbance. I found the antics of children (and adults) an unwelcome distraction from the majesty of the trees. Without speaking my friend Andrew and I turned about halfway into our walk through the forest and returned to the car, in search of quieter groves up north. We would find them.